Deluxe Nail Clipper with Fold-Away 4X Magnifier to Increase Confidence & Reduce Eyestrain Precision, Stainless Steel Blades Sized & Scaled for Tiny Nails For Birth & Up Clipping baby's tiny nails can be stressful - unless you have the right tool! This deluxe nail clipper has a fold-away 4x magnifier to increase confidence and reduce eyestrain, with precision, stainless steel blades and an ergonomic sure-grip shape. Sized and scaled for tiny nails, you'll breathe a sigh of relief with this clever clipper in hand! Made in China Adjust lens for the clearest view; place nail between cutting edges; and squeeze clipper handle and base between thumb and forefinger. For clippers only use; fold magnifier away. To store; fold magnifier down. Then rotate handle to nest inside base. Note: To use clippers again, rotate handle around before lifting the magnifier. To clean: Wipe surface with a soft, dry cloth. May be sterilized by dipping the cutting edges in alcohol. 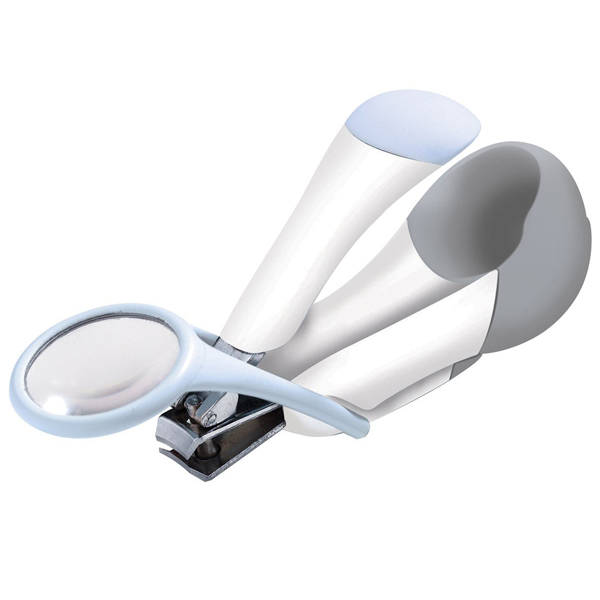 Magnifier: wipe surface with a soft, damp cloth. Due to health and sanitary reasons, this item is non-returnable.